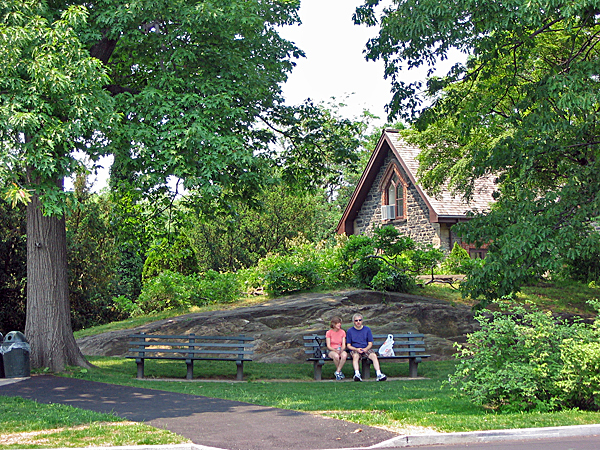 Inspired by the Royal Botanic Gardens at Kew, the City of New York acquired hilly, rocky terrain in central Bronx to establish a botanical garden in 1891. It opened in 1896 with Nathaniel Lord Britton as the first director. 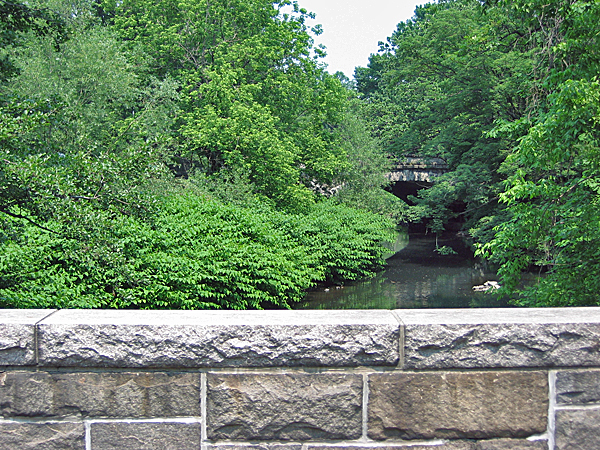 Calvert Vaux and Samuel Parsons, Jr. created the initial design, developing a pattern of curvilinear drives that highlighted the Bronx River and hemlock forest on the site. 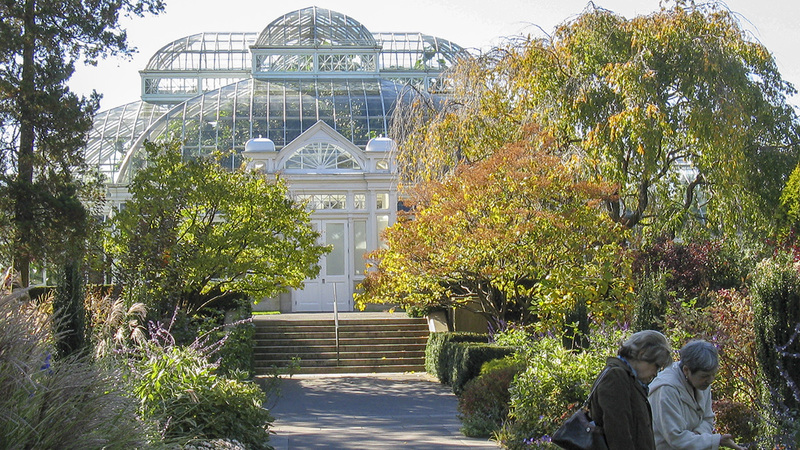 John Brinley’s general plan from 1900 dictated the garden’s growth through the early 20th century, at which time the Beaux-Arts museum building, with its double-row Tulip Tree Allée, and Lord & Burnham’s glass-and-iron conservatory were installed. 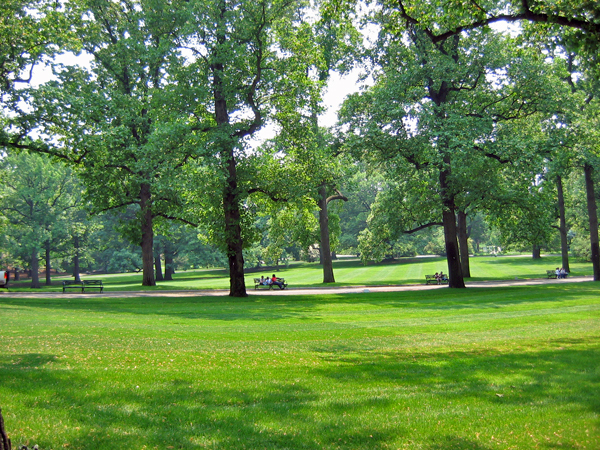 Brinley also expanded Vaux and Parsons’ circulation plan and added planting schemes for numerous new plant collections. Olmsted Brothers’ 1923 master plan revisited circulation and maintenance, which was further developed by Gilmore Clarke’s vehicular circulation plan following World War II. 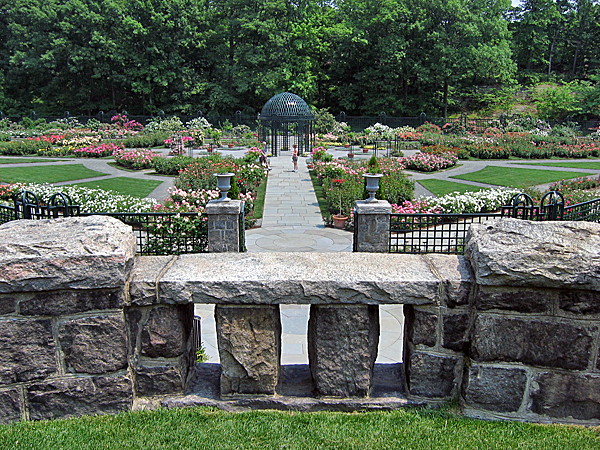 Dan Kiley’s 1977 master plan introduced a new entrance to the garden, the Jane Watson Irwin Memorial Garden, and the Bechtel Rose Garden designed by Innocenti and Webel. 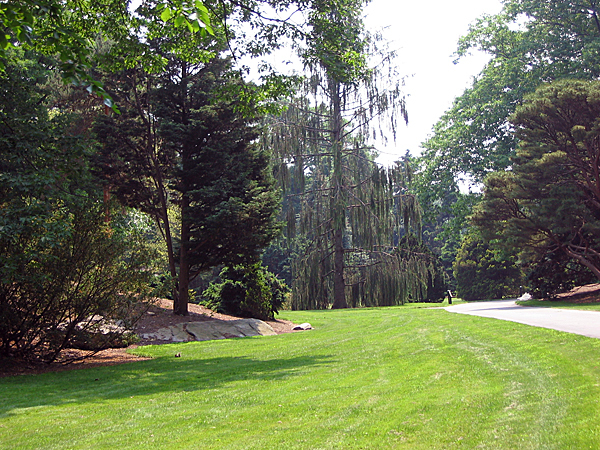 Robert Zion completed a horticultural master plan in 1982.
Notable individual gardens include Beatrix Farrand’s rose garden, Ellen Shipman’s perennial Ladies’ Border, and Marian Coffin’s ornamental conifer arboretum. 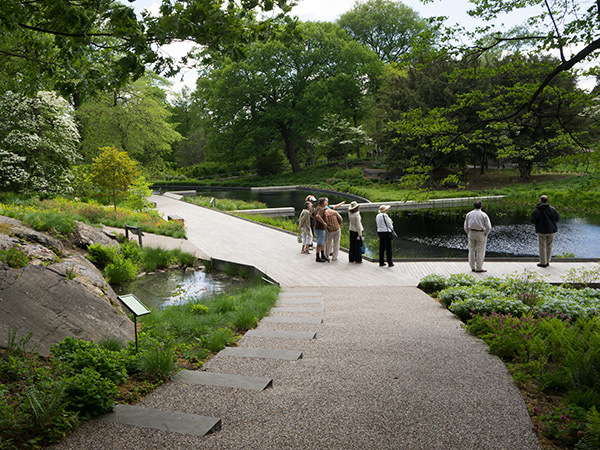 Other significant landscape features include a two-acre rock garden designed by Thomas Everett, an eleven-acre azalea garden, and the Enid A. Haupt Conservatory. 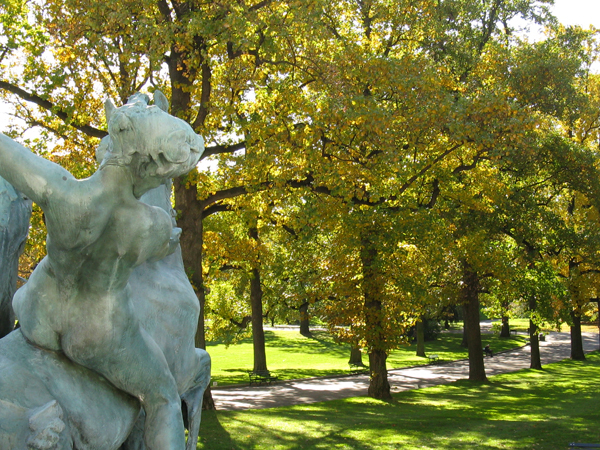 The institution’s LuEsther T. Mertz Library is acknowledged as the most comprehensive botanical library in the Western hemisphere. 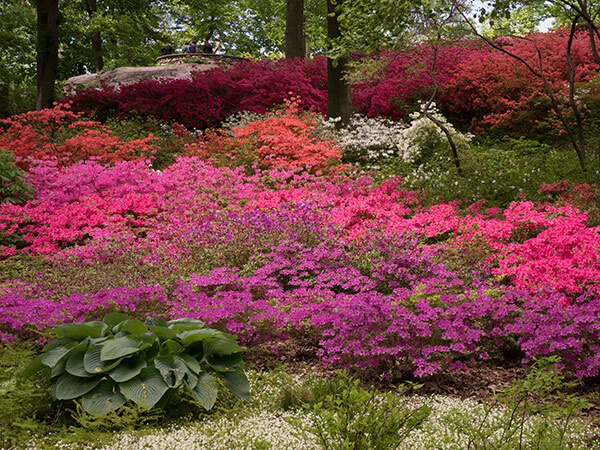 Now measuring 250 acres, the gardens were designated a National Historic Landmark in 1967.